We lived in the basement of a big house in Amsterdam. I remember the smell of moldering bricks. My mother said the whole building was cursed because no one had ever been happy between the walls. At night we heard each other moaning and suffering, or we heard our neighbors trying to kill each other. In the gardens cats were howling. At night, spooky shadows created devils on the walls of my room. On the first floor my father had his atelier. The windows of the place were covered with black velvet curtains as if he strived to keep the real world outside. I didn’t even know there was a real world. In front of the velvet hung big rolls of paper in all kinds of colors and as broad as the walls. My father used the paper as backgrounds for his advertisement pictures. I had to pose for him day after day. If I think back on my childhood I see nothing but pictures. 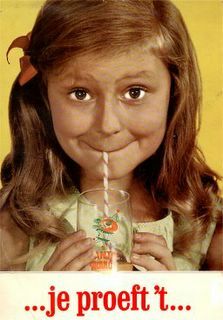 Pictures of a little girl with make-up on her face, eating Saroma desserts, drinking Fanta or Coca-Cola, wearing pop-art dresses or modern coats from the firma Voss. A girl, eating fish fingers produced by Iglo, a girl, sucking ice-cream after ice-cream, shaped by Ola. A girl, captured in settings of happy fake families, who always had discovered some kind of new product that had made their life perfectly perfect. I see a girl that was always smiling to mammies and daddies that looked almost real. I fed them, I hugged them, I did it all while I didn’t move. I just exist there stationary, smirking at my father who had only one eye, a mechanical one. I was so cute, my childhood is frozen in adorable poses that kept me there. Behind all these fixed faces of the many girls I was, I learned to write. I wasn’t allowed to move for so many years, I traveled with words while I didn’t budge a millimeter. Now I stick people with the point of my pencil. I let characters of the past suffer in my stories. I’m evil. I’m sure my mother was right. The whole bloody house was cursed. Uw woorden proeven goed als een vlotte drank. I usually speak English, but I was thirsty for some Dutch words. Thanks for visiting this place.